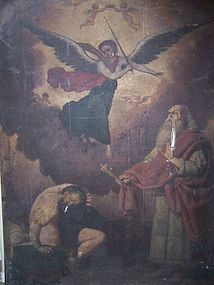 From our European Collection, a very large late 17th century / early 18th century oil on canvas painting believed to be titled "A Warning to the Wicked Ezekiel." This piece is obviously in relic condition with several notable tears, punctures, and heavy soiling both front and back. Please note that this piece is still currently under study and not fully researched, so we must refrain from posting pricing information at this time. As this piece is potentially significant, we have already put out the feelers to our friends and associates at Sotheby's, Christies, and Bonhams, and we certainly welcome any other informed input from others who may be able to further identify this piece, its history and provenance. We thank everybody in advance for whatever assistance may be forwarded, and please be patient on pricing, since given people's holiday schedules, it may be a few weeks before this piece is fully vetted. Size and Condition: 75 inches tall, 56 inches wide. In relic condition as noted above.